So happy everyone enjoyed the photos and tips on styling yesterday. I had a few requests to see a well styled vignette in a larger room setting, so here are some lovely examples on where to put a little more style in your home. 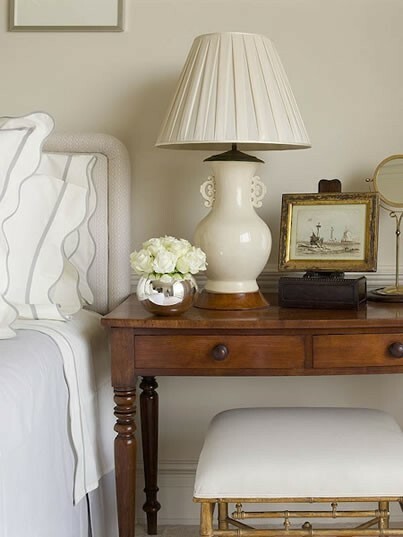 A classic example of a well appointed bedside table. A beautiful lamp, a small piece of art and fresh flowers. I especially like the small bench/stool placed under the open table. The extra layer it provides really takes this look to the next level. 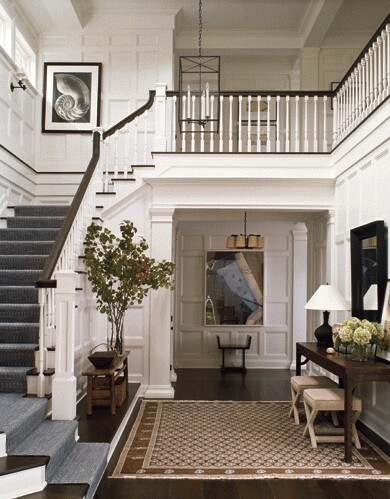 Victoria Hagan, always been a favorite designer or mine, creates beautiful vignettes. The table, like the image above, holds a lamp, fresh flowers, a mirror placed on the wall above and I love the pair of small benches under the table. Use a rug with pattern to give the space a textural element. It's all about adding layers to make the room interesting and inviting. Instead of placing one piece of art on a wall, consider stacking multiple pieces to give the wall more height. I think this one is so beautiful with the art light placed above. Search local antique stores, flea markets and etsy for art that speaks to you. You don't need to spend a lot of money either. Just buy what you love and you'll never regret the purchase. One of my favorite bedrooms. Your bedside table doesn't always have to be drawers only. Consider one with open shelves and place beautiful design books, a simple bowl, a keepsake box and a pretty lamp. Notice the constant in each image... fresh flowers! Just because you work at a desk doesn't mean it has to be bland and boring. Aerin Lauder's desk is a stunning example of how to take your work space to the next level. Place a favorite candle, an attractive container for pencils, a pretty object and once again... a lamp and fresh flowers. Don't ignore the laundry room. Place detergent, clothes pins and dryer sheets in pretty glass containers and add a small potted plant to complete the look. See how adding a gorgeous wallpaper and lantern make this room shine?! 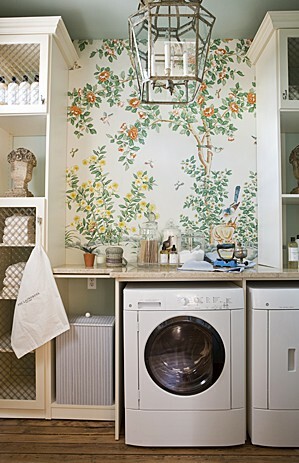 Who wouldn't be happy doing laundry in a space like this! I know some of you are thinking... fresh flowers can be expensive and I can't afford to have them in my house all the time. Just walk out your front door and cut something from your yard. It can be a flowering branch in the spring, a cluster of boxwood or leaves in a simple vase. And for the kitchen, fresh herbs in a vase or a bowl of lemons or oranges will put a smile on anyone's face! Now, get to work on making your home beautiful!